Guist is a small parish in the Breckland district of Norfolk. The village is recorded in the Domesday Book as being an outlier of nearby Hindolveston that was owned by the Bishop of Thetford. The village’s name is derived from Old English and means 'Gaega’s house'. Although the Old English element of the name suggests the village has Saxon origins there is little archaeological evidence to support this interpretation. There are only twenty five records of archaeological sites, finds and buildings from the village in the database. This makes understanding the past of the parish relatively difficult. The absence of finds does not, however, mean that there was no activity here. When compared to other parishes Guist has been relatively poorly investigated with no fieldwalking and very little metal detecting recorded within the parish. There has been little development within the village or outside it and therefore no archaeological excavations have been carried out. However there is some evidence to suggest that people have been living in the area from the prehistoric period. The earliest recorded finds from the parish are a collection of Neolithic worked flints (NHER 7150). Although these are not indicative of settlement they do indicate that people were active in the area. The discovery of other prehistoric worked flint flakes (NHER 22338) strengthens this interpretation. The only other possible prehistoric evidence is a site where some earthwork mounds have been interpreted as possible Bronze Age barrows (NHER 29483). Closer inspection however revealed that they were probably natural features. The only evidence for Roman activity was also found at this site where a fragment of Roman pottery (NHER 29483) was recovered during the inspection. Despite the Old English derivation of the village name perhaps surprisingly no Saxon finds or sites have been identified. It is possible that the village has been located in the same site since Saxon periods and therefore all Saxon archaeology is hidden beneath the modern village. Some of the buildings in the modern village date from the medieval period. 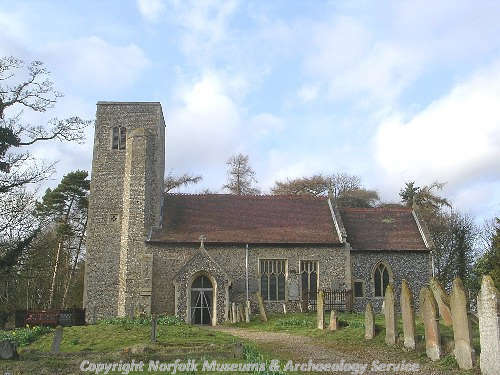 St Andrew’s Church (NHER 3104) definitely has medieval origins and one door is 13th century. Most of the church dates to the 19th century however as it was renovated and rebuilt at this date. The sites of two other medieval buildings can be suggested. The site of Guist Thorpe church (NHER 3101) is recorded on old maps but there are no ruins or evidence for the building at the location. The site of Guist medieval watermill (NHER 16313) is not clear. 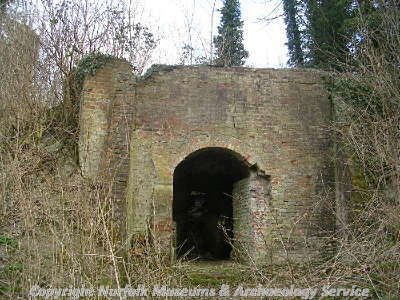 The mill is recorded in a document in 1434 and ruins of the building could be seen in the 17th century. The records may be mixed up with a post medieval mill called King’s Mill (NHER 16314). There have been some interesting medieval finds from the village. A metal detectorist has recovered a copper alloy gilt medieval mount (NHER 29340). This depicts a red enamel lion. Fragments of medieval pottery (NHER 38351) have also been found on Parker’s Piece. There are more remains of post medieval Guist. Two post medieval lime kilns (NHER 12553 and 16684) and a brick kiln (NHER 13807) have been identified. One of these is of unusual type and is protected by an English Heritage listed building status. The toll bridge (NHER 17877) across the river was built in 1773 by a landowner William Norton who decided to charge people to use the bridge. The local pub, The Swan (NHER 35379), was probably built around the same time. Undated human remains at the back of the pub were found in 2000. Manor Farmhouse is a slightly later, probably 17th century, building and two 18th century farmhouses (Church Farmhouse, NHER 42077, and Beck Farmhouse, NHER 43076) also survive. An 18th century building (NHER 12131), perhaps used at one time as an almshouse, was demolished in 1976. Sennowe Park (NHER 30487) is a 19th century landscaped park that covers part of the parish. Within this is the only Italianate winter garden to survive in Norfolk. The garden was designed by George Skipper. Skipper also designed the brick bridge (NHER 21223) that was built in the park in 1910. An unusual find from the village is a coin minted by the Doge of Venice between 1676 and 1689 (NHER 16299). This was found in the garden of Merina on Malthouse Lane. The modern village of Guist was built in 1929 by Thomas Cook MP of Sennowe Park. He knocked down all the ramshackle cottages and rebuilt the settlement as a model village (NHER 45367) including the village green and clock, post office, village hall and fire station. There are also several World War two sites within the parish including a pillbox (NHER 17137) and a spigot mortar emplacement (NHER 31707). A most recent site recorded on the database is a Cold War Royal Observer’s Corps site (NHER 35392). This was used between 1958 and 1968. Megan Dennis (NLA), 26 January 2006.
http://www.edp24.co.uk/Content/Leisure/Walks/asp/Guist.asp. Accessed 26 January 2006.
http://website.lineone.net/~dominicow/St%20andrews%20guist.htm. Accessed 25th January 2006.
http://www.norfolkmills.co.uk/Watermills/guist.html. Accessed 26 January 2006.